For about six months now I have been using this great app on my iPhone4 for planning outdoor photography trips. 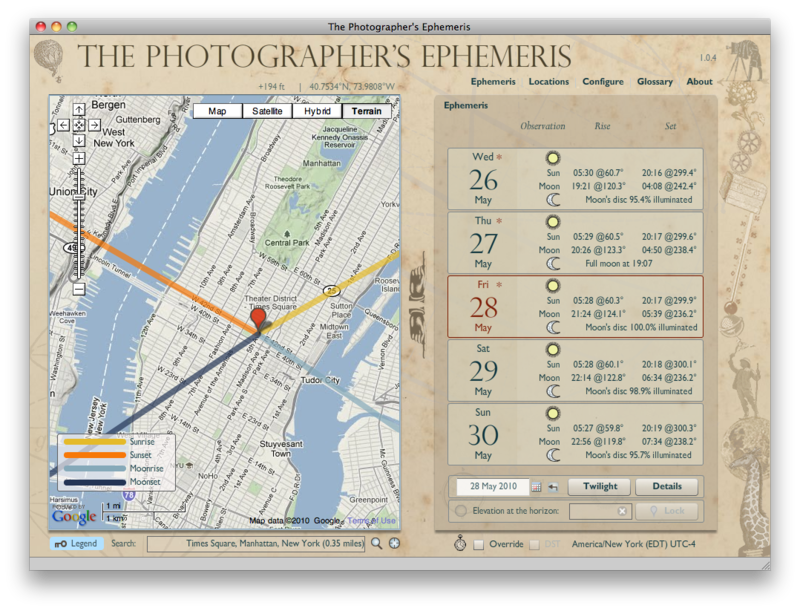 It is called The Photographer’s Ephemeris and it allows you to figure out when and where the sun will rise and set when shooting landscape or urban images. You can also determine the time and direction of the moonrise and moonset. There are additional features like phases of the moon and % of illumination etc. The TPE for iOS has recently been updated with some improvements. Any outdoor photographer will find this brilliant app very useful. I purchased my iPhone 4 at the end of July when they went on sale in Canada, so I’ve had mine for about eight months. As a photographer I really like some of the useful apps that you can download for free or purchase from the Apple App Store. The iBooks app is free and most people use it to download books onto their iPhone or iPad. What I really like about it is that I’ve been able to download many of the user’s manuals as PDF’s from the Nikon website. On my iPhone I now have the manuals for my camera, several lenses and my flash. This is really useful when you are out shooting images and you want to quickly check the manual in regards to settings for your camera or flash. The manuals themselves are big, bulky and heavy. You don’t want to be carrying all this additional weight in your camera pack. To have them all contained and so easily accessible on your iPhone is really helpful for any amateur or professional photographer.